Conquer Online is a free-to-play 2.5 MMO developed by TQ Digital Entertainment offering a fast-paced combat and a myriad of PvP options. 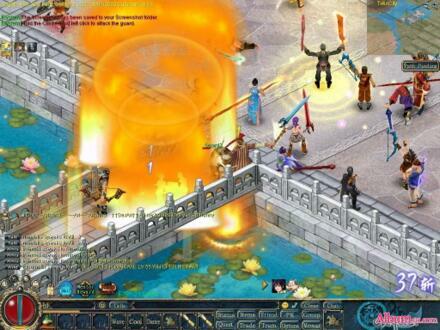 Set in the beautiful and opulent world of oriental fantasy in ancient China, the game favours a straightforward combat-focused play style, incorporating common elements of many MMORPGs such as wealth, fame and character development. Players will take control of a strong and gallant hero, slaying frightful monsters and completing dangerous quests with their friends. There are eight classes for them to choose from: Warrior, Ninja, Trojan, Archer, Monk, Taoist, Pirate, and Oriental Assassin, each one possessing a unique set of skills and powers. In addition, characters can also join various sub-classes and receive different bonus effects. In order to further customise your character, the title features in-depth customization options for an abundant choice of beautiful garments, hairstyles, mount armour, and even weapon accessories. And when there are no more new skills left to learn, no more regions left to conquer and no more monsters left to challenge, Conquer Online offers the great opportunity to be reborn. In this case, your character undergoes a process similar to reincarnation, being finally born again as whatever class you like. For memories of previous lives linger, granting you additional powers, skills and abilities from your old class, reborn characters are much more powerful than newborns, possessing more Battle Power, higher abilities, better skills and visual glamour. Conquer Online has a visual style that resembles the traditional Chinese hand-painted artwork and moreover provides a complex mount system allowing players to fight on horseback and to breed new mounts with each mount having its own attributes. Among the multiple PvP events the game offers there are many different types of PvP action, like the Guild War, Class PK tournaments, Team PK tournaments, Faction Wars and more.